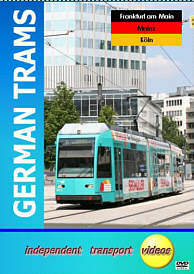 We start our tour of three German tram systems on this video programme with a visit to the financial capital of Europe – Frankfurt. Starting in 1994 we see the first of the low-floor Duewag trams just delivered in the new all-over aquamarine livery, which contrasts nicely with the familiar orange, cream and brown scheme applied to the older Düwag units. The system runs on 119.4 km of standard gauge track (1435mm). We make a further brief visit in 1997 before retuning in 2007 for a more comprehensive look at the system filming in some of the same locations and a whole host of new ones. The fleet is now 100% low floor with a new fleet of Bombardier vehicles adding variety to this very smart and efficient system. Our second location is to the historic Rhein city of Mainz. In 2007 the fleet is made up of new 100% low floor ADtranz cars. There are three routes that run on 19.3 km of 1 metre gauge track. Our locations include the historic Gautor Straße area and the busy Bahnhofplatz. Our third tram system visit is to the city of Köln located on the river Rhein and dominated by a massive cathedral. We make two visits, the first in 1998, the second in 2007. Here we see the modern fleet of Bombardier cars in action. Running on 190.3 km of standard gauge track, they look very similar to the trams operating in the UK on the Croydon Tramlink system even down to the fleet livery of red and white. So enjoy the experience of mainland Europe’s modern clean urban transport. Duration : 67 minutes (approx).